If you’re in the mood for delicious popcorn, frosted nuts or old-fashioned candy, Topsail Island Popcorn Factory is the place for you. 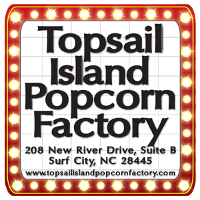 Our Topsail Island, North Carolina local company sells everything from Bacon flavored popcorn to Wasabi flavored popcorn. With four selections of frosted nuts and over three dozen varieties of candies, you won’t be disappointed in our selection. No matter what kind of snack you’re in the mood for, just POP ON IN ! Topsail Island Popcorn Factory has more than we can list and adding more flavors each day! Our popcorn is available in Small bags (approx. 6 cups) and Medium bags (approx. 12 cups). We also have large bags made to order and coming soon pails and tins that can be refilled. Popcorn is meant for people of all ages to enjoy. Stop by today and see how our popcorn is made through our viewing window. Popcorn is a healthy treat that you can enjoy anywhere, at any time of the day. We make our popcorn fresh daily using Pure White Coconut Oil, and we are the only company on the island that does so. Our popcorn is a great snack for a day on the beach, going fishing or boating, enjoying time on the golf course, traveling, or taking in the Friday Night Movie and Soundside Park (seasonal). 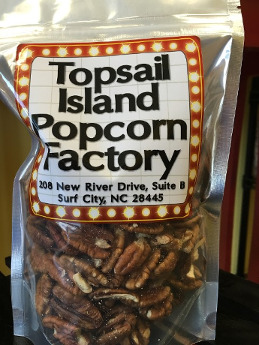 Topsail Island Popcorn Factory is proud to offer a selection of Frosted Nuts made right here and packaged in 4 ounce and 8 ounce sizes for you to enjoy. Some of our current offerings include Cinnamon Sugar Frosted Pecans, Almonds and Peanuts. These are a sweet treat we are sure you will love. 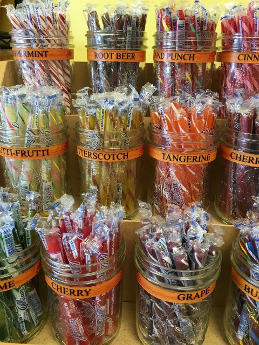 Children and adults alike will love our retro candy. No matter how long ago your childhood was, our nostalgic candy selection is sure to bring back happy memories. We have many more candy items available than those that are listed here, so stop by today to check out our full selection.